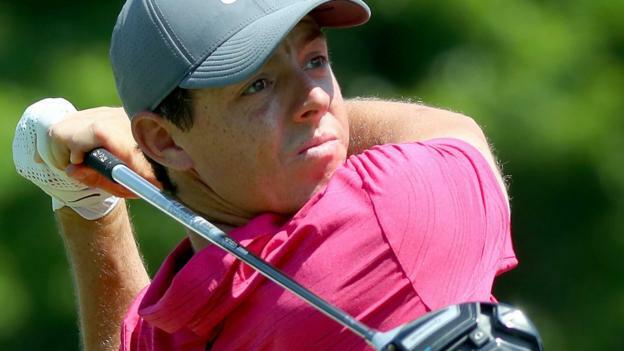 Northern Ireland’s Rory McIlroy and England’s Ian Poulter are tied for second heading into the final round of the WGC-Bridgestone Invitational. Four-time major winner McIlroy carded a three-under 67 and Poulter a 70 to stand 11 under, three shots behind leader American Justin Thomas (67). “I’m excited for Sunday to see how everything holds up,” said McIlroy. Tommy Fleetwood, who had shared the second-round lead with Poulter, shot 74 to fall back to seven under. McIlroy added: “It felt good, I hit a few more fairways today which definitely helped. “I drove the ball well, gave myself plenty of chances, didn’t convert too many but even when I put myself out of position I held some good pars. The 14-time major champion Tiger Woods carded a 73 to slip to three under, while 2017 Masters champion Sergio Garcia is a shot better off. The final major of the year, the PGA Championship, begins on Thursday.